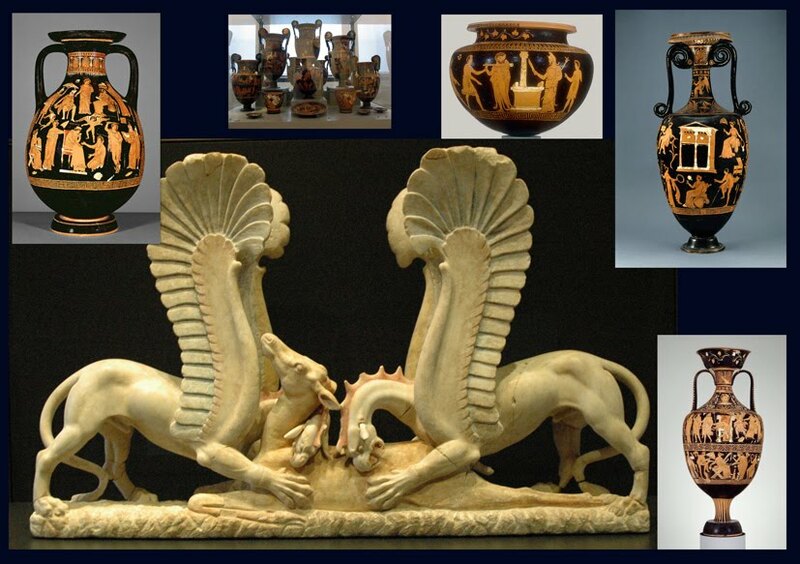 Lord Renfrew has issued a summary of the paper ("Combating the Illicit antiquities trade: progress and problems") he gave at the International Meeting on Illicit Traffic in Cultural Property organised by the Ministero per i Beni e le Attività Culturale, in Rome in December 2009. He acknowledged the "real international progress" that has been made, including the return of antiquities from major returns (see our earlier discussion). Renfrew emphasises 1970 as the benchmark for collecting histories. This is certainly now recognised by the North American community as a key date for acquisitions, though, in my opinion, there is still the issue of long-term loans. Renfrew touches on the issue of cultural property claims that pre-date 1970 such as the Parthenon marbles and the Benin bronzes. He also discusses the Martin Schøyen collection of incantation bowls that were on loan to UCL. I had seen the extraordinary marble sculpture of the Griffins at Malibu, both at the Villa where they were originally exhibited by the J. Paul Getty Museum and then at the inaugural installation at the new Getty Museum in Los Angeles. Indeed so striking and unexpected was the impression then made on me that I was quite doubtful of their authenticity. That is one of the prices which one pays when antiquities are clandestinely removed from their context of discovery. And now, at the Palazzo Massimo I saw not only the Griffins and the remarkable painted marble basin but a whole assemblage of marble artefacts, including the painted calyx crater and the splendidly severe group of marble vessels (loutrophoros, epichysis, oinochoe) which apparently formed part of the original tomb group. A single de-contextualised artwork now had an important series of accompanying pieces. These added greatly to the significance of the extraordinary Griffin piece. But in addition they themselves became of vastly greater importance. But the marbles are only part of the "assemblage". It has been reported elsewhere that they were found with "a number of vases by the Darius Painter" (see earlier discussion). One of the interesting features of the returns from North America have been the pots attributed to the Apulian pot-painter dubbed the Darius painter: from Boston's Museum of Fine Arts, the Cleveland Museum of Art, Malibu's The J. Paul Getty Museum, New York's Metropolitan Museum of Art, and the Princeton University Art Museum. And we must not forget the tomb-group incorporating pots attributed to this painter in Berlin. Could the marbles have been associated with any of these pots? Indeed is it possible that they were found with Apulian cavalry armour? The answer is we just do not know details of the tomb and its original contents. Renfrew turns to other re-contextualised material; he dubs it "post-disjunctive forensic re-contextualisation". (Surprisingly, he does not mention Morgantina where Malcolm Bell appears to have discovered the holes from which the silver hoards appear to have been removed.) Renfrew suggests other examples such as the Sarpedon krater for Cerveteri, and the fragmentary marble figures from Keros in the Cyclades ("the Keros haul"). The summary of Renfrew's lecture makes it clear that Italy has been able to address the issue of looting. Now it is the turn of museums, collectors, and dealers to avoid acquiring or selling pieces that do not have a recorded collecting history that can be traced back to the period before 1970. Composite of some of the returns from North America and other items on display in a European Collection.